On Saturday Jen prepared the guys for the annual Beaster celebration at Joe and Ryan's. Sadly I could not attend this year as I was working. According to reports it went very well apart from a thirty-minute freak out session by Martin. 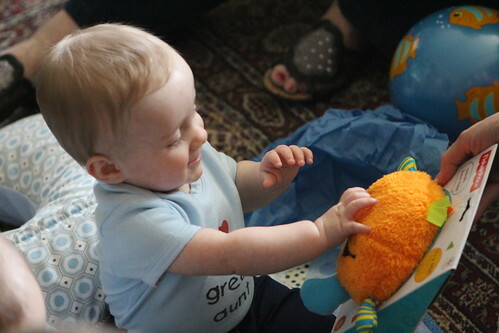 Jen was cranking some Raffi music for a while to try to calm him down. After that didn't work she realized she might as well listen to whatever she wanted if he was just going to freak out anyway. I do the same thing with them when I'm driving them around but it's usually a podcast that does little to soothe them. 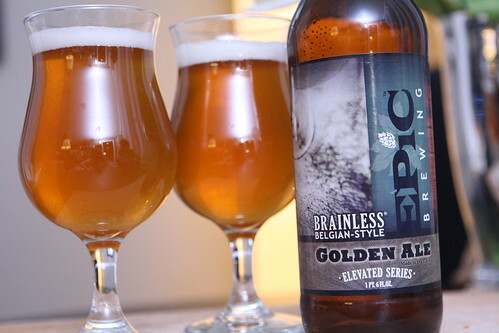 After a stressful bedtime routine we settled back with an embarrassing hodge podge of leftovers and this Brainless Belgian-Style Golden Ale that from Epic Brewing, another beer Jen brought back with her on her recent trip to Utah. It was a very nice, softly-carbonated Belgian-style golden ale and the perfect way to cap off an evening when you know you should be cleaning up instead. 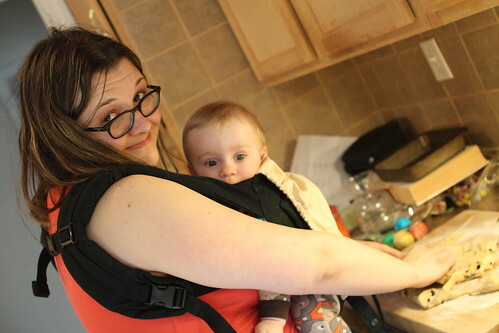 Yesterday morning Martin was having none of his nap so Jen had to resort to wearing him in his carrier while she made hot cross buns. He had that look on his face that said, "Yeah, I know I'm being a jerk, but in the end I got what I want and for that reason I am happy." 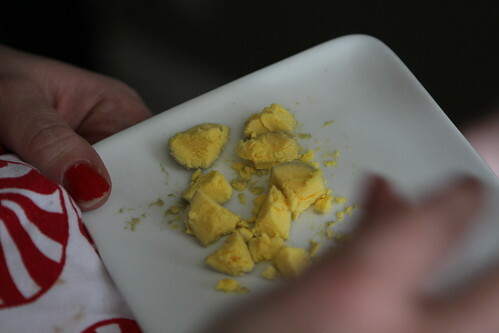 Since it was Easter we decided to feed the Wombats their first eggs from some of the leftover undecorated eggs we had. 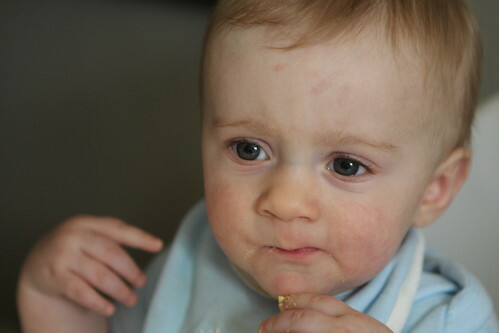 It did not appear to be their favorite food of all time, however, we put the cut up yolks in front of them and they did continually reach for more and ate most of the pieces. So either they're just gluttons for punishment or they just aren't all that bright. My parents arrived with my Aunt Deb and Aunt Pat who brought them gifts. 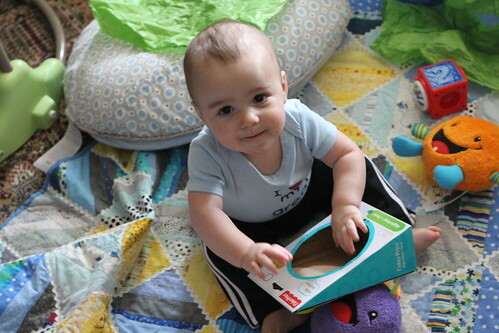 Elliott, in classic baby form, enjoyed the box the more than the toy inside. 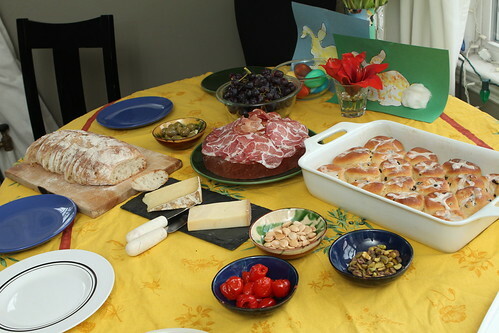 For brunch we had a spread of hot cross buns, prosciutto and copa, a cheese slate with Cantalet and Meule de Savoie, peppadews, olives, Marcona almonds, pistachios, grapes, and ciabatta. 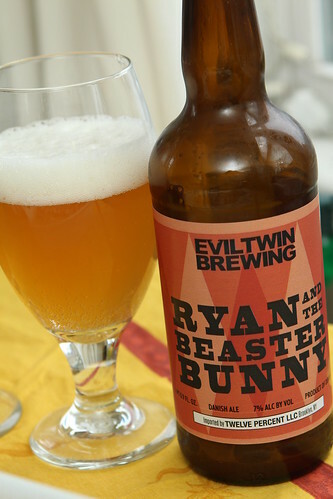 For a refreshing afternoon beer we had this Ryan and the Beaster Bunny from Evil Twin Brewing in Denmark. I picked this up a couple of months ago in anticipation of Easter. Since I've never seen an Easter-themed beer before I figured this would be perfect. It was a very nice, refreshing, farmhouse style ale that went very nicely with Easter brunch. I'd highly recommend it to anyone looking for oddly-named Easter-themed beers. 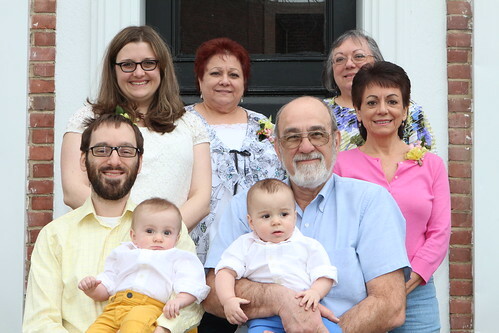 After eating we assembled outside for family portrait outside which was far easier than it had any right to be. They've gotten a lot bigger since our last portrait out in front of the house. And at least this time Martin's head is not blocked by mine. 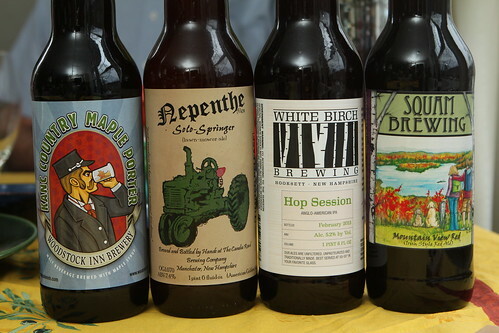 My Aunt Pat journeyed all the way down from New Hampshire and also brought a gift for me: New Hampshire beers! Unlike Elliott I did not play with the box, I played with the beer. 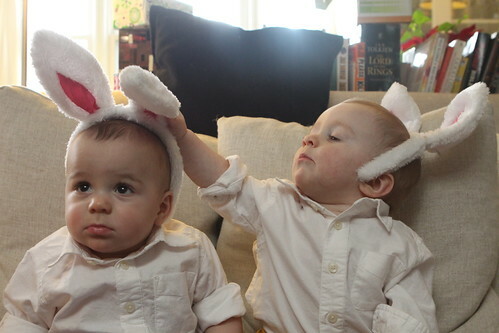 We tortured the poor, sweet babies by taking a series of pictures of them wearing bunny ears given to them by their uncles Joe and Ryan. 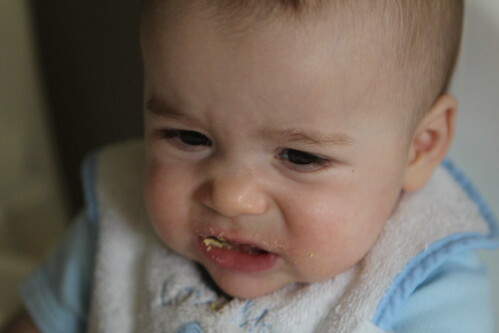 This picture is indicative of how well the photo shoot went. 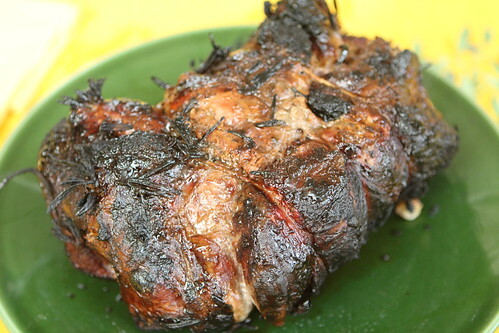 I did a leg of lamb on the rotisserie on our grill for the first time. 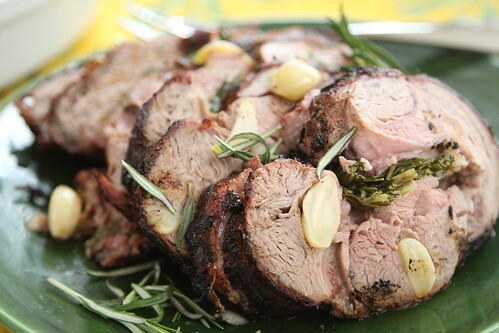 I've never done lamb on the rotisserie before so I figured I'd be safe by setting my alarm for thirty-five minutes then going to check on it. I figured this would be the half way point in the cooking process. As soon as I rounded the corner to the back where the grill was I could smell that it was quite a bit more advanced in the cooking process than I'd wagered on. When I opened up the grill I was convinced I'd ruined it. 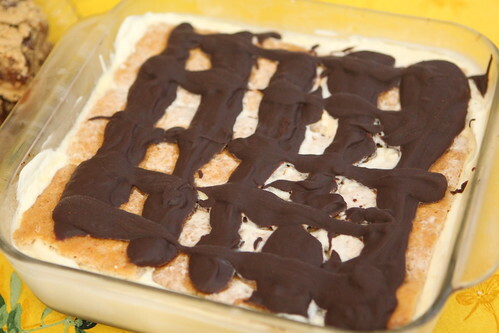 Fortunately, while it was a bit more done than I'd have liked, it was not ruined. The taste was good but I could have gone with a lower flame. It was a little north of medium where I would have preferred a medium rare. 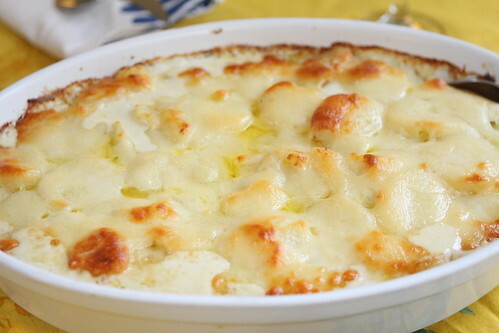 My mother brought some delicious cheesy scalloped potatoes that I had to rush in the oven since I hadn't counted on the lamb being done so early. They were fantastic. 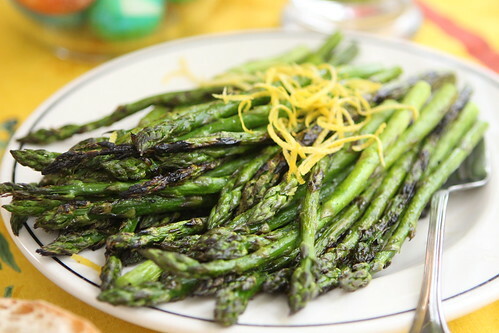 After removing the lamb and replacing the grill grates I grilled up this asparagus and zested some lemon over it. 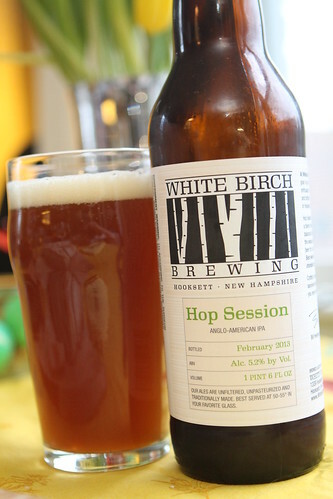 To accompany the dinner I had this Hop Session IPA from White Birch Brewing, a gift from my Aunt Pat. It was uncharacteristically murky and dank looking for an IPA with a very nice piney, resiny flavor to it. 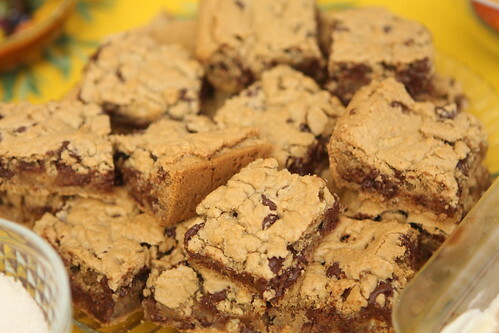 For dessert we had Napoleons (clumsily made by me), and blondies (expertly made by my Aunt Deb). 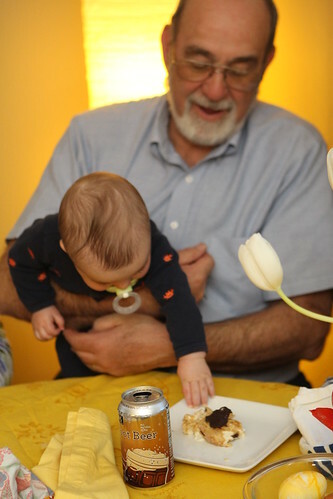 The Napoleons were a particular point of interest for Elliott who showed Grandpa just how strong he could be when he wills 100% of his bodyweight toward an object he wants. Grandpa was almost unable to contain him. Elliott has a lot of vim when it comes to snagging desserts and he has just as much drive when it comes to fighting off his inevitable bedtime. Luckily for us while he fights hard he does not fight long. Sadly, Martin has both the passion for avoiding sleep and persistence to spare. After a lengthy wrestling tag team match with the Wombats and both parents they did get to sleep and we were able to bid a fond farewell to our visiting family. 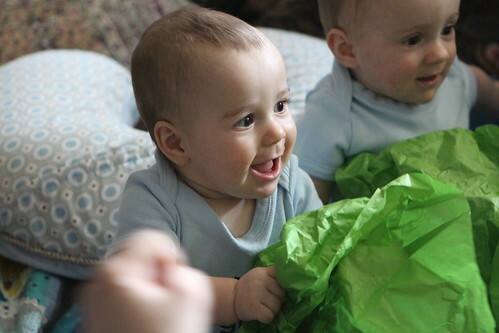 It was a bit more hectic than last year's Easter (where I commented on how I would puree Cadbury eggs for them) but far more rewarding. 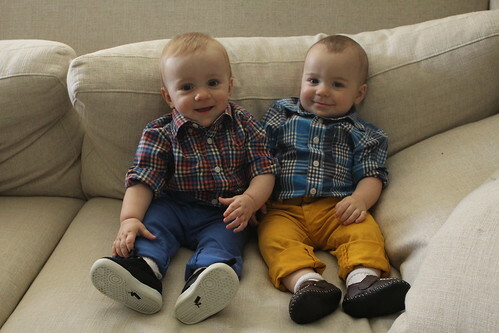 Another first holiday down for the Wombats. Next up: Cinco de Mayo! This is gonna be huge!